If you live in the modern world, dieting images are everywhere. Other than tribes that live deep in the rainforest, everyone is exposed to the diet industry’s marketing ploys. The promise of a radical life change if you only lose a few pounds is appealing. Want to feel more confident? Drop a dress size! Do you want the attention of that hottie you’ve had your eye on? Hurry to the gym to tone that tush! These ads are meant to draw you in so you fork over your hard earned money on empty promises. If you are someone who welcomes the newest diet, then the hardest part is just deciding which diet will be the flavor of the month. But if you have vowed to shun dieting, these ads can be particularly challenging. When I decided that I had had enough and hit diet bottom, I sought help and was introduced intuitive eating by my dietitian. Even though IE flew in the face of all of my food rules, I knew I couldn’t bring myself to diet anymore. Sure, I was hesitant about the process, but I knew that legalizing my forbidden foods, getting rid of food labels, and giving myself permission to eat was what needed to be done for both my physical and mental health. Despite my gung-ho determination, I wanted to give up. Often. Even though I took it slowly and went at my own pace, there were times when I wanted to just throw in the towel and rush back to my diet. I would see a picture of a celebrity1 or hear people praised for weight loss and it took all I had in me to not revert to counting points or weighing myself multiple times a day. I wouldn’t be writing this if I had given up on IE, but it was far from easy. Yes, I knew the research about how dieting doesn’t work, but the irrational part of my brain didn’t care. I felt I couldn’t fully open myself up to the process because there was uncertainty. I wondered if I’d ever be able to stop eating or what my body’s natural weight would be. I slowly learned to trust that my body would tell me what it needed and the process got easier. To be honest, there are still times when I feel a tickle of an urge to diet, but then I remind myself why dieting sucked2 and the urge fades. 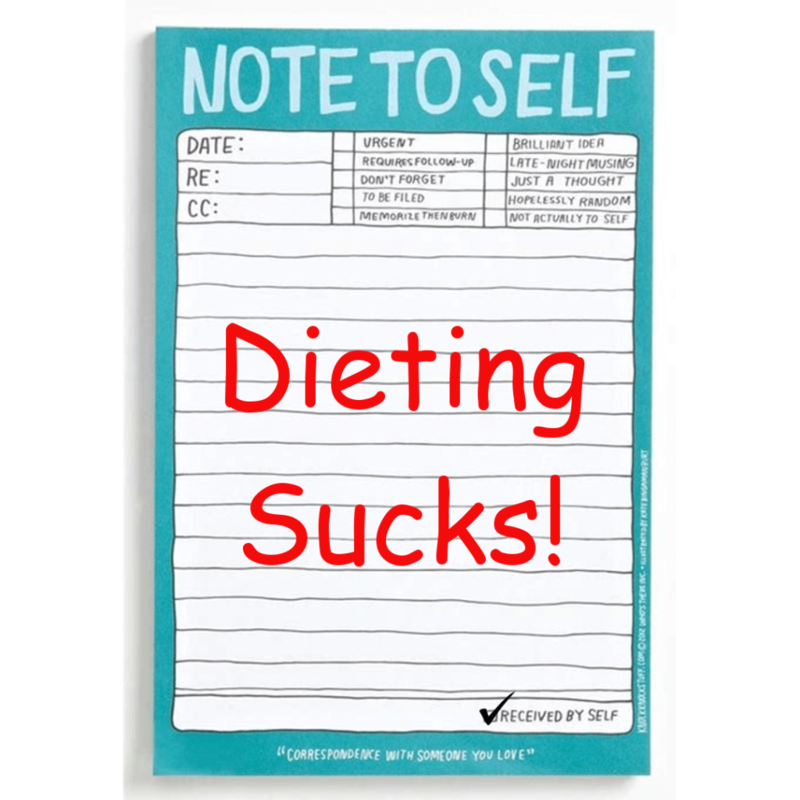 As a way to help me through these times, I created a list of what I don’t miss about dieting. Intuitive eating is anti-diet, but we are all human. Who doesn’t want to cash in on what the latest diet will offer?5 But lurking beneath are false promises. I sometimes thought that IE wasn’t the right path for me, but my hatred for dieting won that battle. I didn’t succumb and dieting ads eventually became background noise. However, there’s nothing to be ashamed of if you question your commitment to intuitive eating. It is an uphill battle and any weary dieter might consider giving up during tough times. And it could be that your mind isn’t receptive to the concept of IE at this moment in your life for whatever reason. That’s okay. IE will still be here when you are ready. If you are in a place where you want to try it but have doubts, think back to the horrors in your dieting history and hopefully that helps you take the next small step in your IE journey. What do you not miss about dieting? Please share in the comment section below. 1A Photoshopped picture, I might add. 2I tried to come up with a more eloquent word, but “sucked” does a good job of summing up my feelings about dieting. 3This ranged from counting out an exact number of nuts to worrying about whether the clove of garlic I added to my meal was small or medium sized. 4Chipotle was a “safe” place for me…and I didn’t even like Chipotle! 5If you are reading this around New Year’s, remember that diet companies are out in full force right now! They don’t care about you. They are trying to increase their profits. It’s all about money! I don’t miss having to think about what is a good food choice and what is a bad food choice. Yes! The “good food” vs. “bad food” dilemma is really draining! When I realized how much I had been $uckered by the diet industry, I used the anger to fuel my stick-to-it efforts for IE. The allure of diet promises morphed into diet demons taunting me with what THEY wanted me to buy into. Guilt, shame and remonstrations targeted at what I was doing had to be fended off with sharp “NO!”s. Drawing my focus back INto my body and its needs helped me to move away from the grabbing demands and false ideals that were all that dieting had to offer me, mislead really! I also have a sharp voice that I utilize sometimes when dieting thoughts come my way. Not in a self-bullying type of way but just firm. -I don’t miss any of the things you mentioned! I did all of those awful things, except I never worried about being too boney, because I’ve never been that thin, lol! -I don’t miss the stress of being off my diet knowing that it is almost time to go back to “really watching it.” I don’t know if my experience is unique, perhaps not, but I used to work really, really hard for several months doing all things you mentioned. I would lose some weight, nothing super dramatic, but I would feel good about it. But then somehow I would “fall of the diet” because of the holidays or something, and then slowly regain the lost pounds over next several months. -I don’t miss constantly berating myself for “messing up the day” because of some minor infraction (like having one cookie!) This meant I constantly had to start over the next day and the “messed up day” was a wash out. Gosh, when you write stuff like this down you really see how messed up this kind of thinking is and how disconnected your thinking gets from your body’s signals. I don’t think your experience is unique. Many people seem to work at their diets and then “fall off the wagon” whether it’s consciously or unconsciously (And I hate that phrase too. There shouldn’t be a dieting wagon to begin with!). I also found it scary when I wrote down all of my dieting habits at one time. It made me realize just how far I had been sucked in. At least we recognize this now and refuse to go back to that!